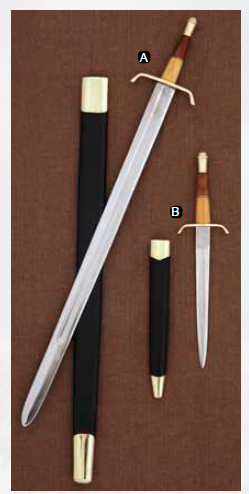 Blade Width (Widest): 1.8" Overall Length : 38"
A brass and polished wooden hilt, on a Single Tang constructed, 18-gauge EN45 spring steel blade, with real leather covered scabbard. The arming sword (also sometimes called a knight's or knightly sword) is a type of European sword with a straight double edged blade of around 27 to 32 inches. In common use from the 11th to 16th centuries. This is the companion piece to the Arming Battle Sword, featuring a matching brass trimmed, real leather covered scabbard, plus matching brass and polished wooden hilt. The straight double edged, spring steel blade constructed blade, make this a keeper. The MS I.33 manuscript, dated to c. 1290, shows fencing with the arming sword and the buckler. This page was last modified on 8 June 2014, at 10:45.